Concussion symptoms aren’t always obvious. Here’s what to look for. Avoiding sports where concussion is a particular risk—football especially—is a step some parents and teen athletes take in order to avoid concussion symptoms. A concussion is more than a knock on the head that makes your mind foggy for a while. Research has linked concussion with a greater risk for dementia in older age, while other studies suggest that the concussions many teen athletes sustain while playing sports such as football and ice hockey can result in brain changes that last several months. Unfortunately, concussion symptoms may be so mild that they go undiagnosed. The bottom line? Following a head injury, it’s vital to be aware of signs that might be concussion symptoms so that you can seek medical advice. A concussion is categorized as a traumatic brain injury. While concussions are typically the result of a blow to the head, they also can occur if a sudden, sharp jolt causes your brain to shift inside your skull to the extent it crashes against bone. While a concussion may involve loss of consciousness, this isn’t always the case—you can have a concussion without knowing it. It’s also possible for concussion symptoms to develop hours or even days after you were injured. Who’s at Risk for Concussion Symptoms? As many as 20 percent of American teens have had a concussion at some point, and some of them have shown concussion symptoms more than once, according to a 2017 study (Journal of the American Medical Association, Sept. 26). Researchers working on the study, which looked at 13,000 U.S. kids in grades 8 to 12, concluded that contact sports had the strongest association with concussion symptoms. Alarmingly, the data suggested that the rate of concussion among teens is higher than previously indicated by emergency room visits—and other research (Mayo Clinic Proceedings, December 2017) suggests that overall, only about one-third of high school sports coaches and athletes are aware that a concussion signals an injury to the brain. In that study (which covered a wide range of contact and non-contact sports, including football, soccer, hockey, baseball and wrestling), coaches were more clued in than their kids about whether players should be removed from the field after an injury, but kids were better at identifying concussion symptoms. It isn’t just teen athletes who are at risk for concussion. For example, all of us who drive should get informed about concussion symptoms, since automobile accidents raise your risk. It doesn’t have to be a severe accident either, especially if you’re a frail older adult. Falls are another risk factor for concussion symptoms, particularly in seniors and young children who are just getting on their feet and learning how to walk. If you’re an older adult and you fall, it’s vital to inform your doctor and be aware of what signs might be concussion symptoms. The same goes if you’re the parent of a toddler or active preschooler. Where the latter are concerned, keep in mind that if a toddler or young child has concussion symptoms, he or she may not be able to tell you. You also may confuse symptoms such as irritability and crying for “normal” toddler tantrums. If your child is excessively cranky, uninterested in playing, appears dazed and/or listless, and is physically uncoordinated (for example, walking unsteadily compared to his or her usual gait), contact the pediatrician immediately. If you know your child has incurred a blow to the head, seek medical advice immediately even if he or she doesn’t seem to be hurt and there is no visible bump. 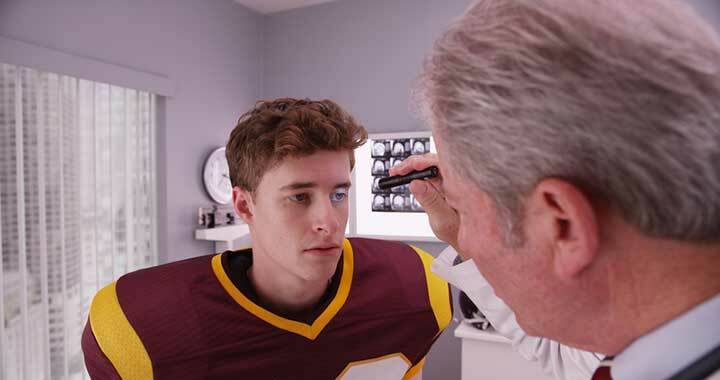 Avoiding sports where concussion is a particular risk—football especially—is a step some parents and teen athletes take in order to avoid concussion symptoms. Even so, football remains a popular sport for kids: There are more than 1 million players of high-school age, while the Pop Warner kid leagues have about 250,000 players. Fortunately, the injury rate for these younger kids is lower than it is for high school and college-age athletes. Proper tackling is a must. Officials and coaches must enforce the rules of proper tackling (including zero tolerance for illegal, head-first hits). Balance the benefits and risks. Players must decide whether the benefits of playing outweigh the risks of possible injury. Focus on non-tackle football. Non-tackling leagues should be expanded so for teens who want to play football without incurring the risks associated with tackling. Continuous monitoring. Skilled athletic trainers should be available on the sidelines at practice and games—evidence shows that their presence can reduce the number of injuries for players. Wear protective headgear for sports and leisure pursuits such as cycling and horse riding. Always wear your seatbelt, and upgrade (if necessary) to a vehicle that has head supports on the seats. If you’re an older adult, ensure that your home is adequately lit, and remove tripping hazards such as throw rugs. If you are the parent or caretaker of a young child who is learning to walk, remove tripping hazards and low furniture (such as coffee tables), and install safety gates at the bottom and top of stairs. If you are the parent or caretaker of a teen athlete, schedule a conference with his or her coach to discuss what precautions can be taken to keep your child safe. Also talk to your child about concussion symptoms and risks, and what to do if concussion symptoms occur. bone, brain, children, coffee, concussion symptoms, dementia, dizziness, head injury, headache dizziness, headache pain, light sensitivity, medical advice, pain, traumatic brain injury.